IMPORTANT: Print this page now for your individual forklift training. You’ll need this checklist when you sign up for the certification class. Do you know how to operate a forklift but lack individual forklift certification? CertifyMe.net can help you get your OSHA forklift operator card in less than TWO HOURS for only $59.95. What is Individual Forklift Training? You’ve most likely heard of forklift training, but you might be wondering what individual forklift training means. The difference between our program and others is that you aren’t training in a group of students. Group training can be less expensive than one-on-one training, but it often isn’t in-depth enough. Our program, being online, combines the convenience and affordability of a group program with individual support. Each operator completes our training program by themselves, at their own pace. Once they’ve worked through the written modules, they take a test and an in-person practical assessment to receive their forklift certificate. CertifyMe.net specializes in individual forklift training – sign up with confidence today! Why Do I Need OSHA Individual Forklift Training? OSHA has the authority to levy a penalty on your employer of $7,000 per untrained forklift operator. For willful violations, this can escalate to $70,000. If you already have a job and don’t have individual forklift certification, make yourself indispensable to your current employers and contact CertifyMe.net to get your individual forklift certification. Aside from the obvious safety and legal benefits, individual forklift training from CertifyMe.net enhances your job prospects as well. Employers only want the best qualified candidates – and with individual forklift training from CM, you’ll have the skills and knowledge necessary to stand out from the rest! How Do I Get Individual Forklift Training? Create an account with CertifyMe.net and complete the three simple steps as indicated below. Before CertifyMe.net can help you to get individual forklift certification, you need to get some training and experience operating a forklift. Here are a few ways you might be able to learn how to drive a forklift. How Does OSHA Individual Forklift Training Work? 1. Classroom-style individual forklift training. This is completed online and CertifyMe.net will train you in all vital OSHA safety topics. 2. An online test of your individual forklift operator training. This satisfies OSHA that you understand their requirements. We use open-book testing so you may review the course material to make sure you understand it. Once you have passed this phase of your individual forklift operator training, you will be able to print out a check-off sheet for the employer to use to complete the third and final step. The first two steps of your individual forklift operator training can be completed in less than two hours. 3. Hands on Exam. It is MANDATORY that your employer conducts this step. In order for you to obtain your individual forklift certification, your employer is required by law to conduct and document a hands-on examination. This test must be specific to both the workplace and to the equipment that you will be using on site. When Will I Get My Individual Forklift Certification? Once you have passed the test for the online training and you and your employer have gone through the hands-on checklist, you will be able to print a temporary certificate and operator card. An original, printed copy of both documents will be sent to you in the mail at the address you gave when you registered. Our individual forklift training records should be placed in every employee’s training record file, just in case there is an OSHA audit down the road. Once your individual forklift training certification is filed away, you and your company are considered OSHA compliant, which helps limit liability for any future accidents – yet another reason to sign up with individual forklift training from CertifyMe.net. Why Choose Us for Individual Forklift Training? Now that you know how to get a forklift certification, you may be wondering why you should go with our program. We’ve designed our program for individual operators in mind; that means we’ve worked hard to make it as convenient, fast, and affordable as possible while complying with all OSHA standards and requirements. Stand out to potential employers! Higher chances at getting hired and the opportunity for pay raises are pretty incredible benefits to getting certified with our top notchindividual forklift training program. However, the most important part of it is that you’ll have the tools and knowledge you need to protect your life on the job and avoid accidents. 1. If you are not currently affiliated with a company you will need to create an account for your self. 2. Use your first and last name in the Company box. 3. Enter your own information in the rest of the fields of the registration form. 4. Use your email or an email account you have access to. 5. Double check your mailing address. This is the address where your permanent Certificate and laminated Operator Card will be mailed. If you don’t give us the complete address your certificates will be delayed. 6. Complete the Register a Student form using your own information. Select the training class you wish to complete and then continue to the secure online payment page. 7. Log in from the home page to begin training. In as little as one hour you will be able to print your OSHA forklift safety credentials right from your own computer, and in about 7-10 business days your permanent Certificate and laminated Operator Card will come in the mail. If you don’t have forklift operator experience – read this! If you don’t have prior experience operating a forklift, our service is not for you. BUT, see below for five places to get forklift training. Make it known at your current job that you desire forklift certification and move up to become a licensed forklift operator. If you’re already experienced in operating forklifts and you’re ready to receive your formal individual forklift training, create an account today! 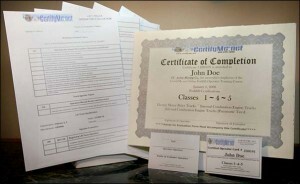 CertifyMe.net can help with all of your individual forklift training needs. Our training packages are ideal for individuals or group settings. If you have a reliable internet connection, you can take your individual training course when it’s convenient for you.